Monarch Air Group provides private air charter in Knoxville, TN. Our clients benefit from top-notch service, unrelenting dedication to safety, wide selection of aircraft, and years of experience in chartering private jets. To obtain a free quote, please use our online quoting tool provided below, or call toll free 1-877-281-3051. Monarch Air Group offers air charter services to and from Knoxville, TN, USA. 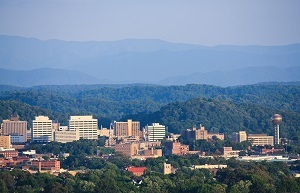 Knoxville lies in the valley between the the Great Smokey Mountains to the east and Cumberland Mountains to the west. It is the third largest city in the U.S. state of Tennessee, behind Memphis and Nashville and the county seat of Knox County. Since its founding in 1791, the city has served as an important industrial port and the centre of the region. Being a scenic metropolitan city and the cultural center for East Tennessee, Knoxville is home to the University of Tennessee and some cultural and historical attractions including the Blount Mansion, the Frank H. McClung Museum, the Old City, the Beck Cultural Exchange Center, the Statue of Alex Haley, the Sunsphere, and the World’s Fair Park. Throughout the year Knoxville hosts plenty of festivals and events such as Chrysler Jeep Boomsday Festival, Dogwood Arts Festival, Big Ears Festival and Knoxville Symphony Orchestra. 1. CSV, Memorial, Crossville, United States. 2. GCY, Municipal, Greenville, United States. 3. GKT, Gatlinburg, Gatlinburg, United States. 4. MMI, McMinn County, Athens, United States. 5. MOR, Moore-Murrell, Morristown, United States. 7. TYS, Mc Ghee Tyson, Knoxville, United States. 1. The Oliver Hotel, 407 Union Avenue, Knoxville. 2. Crowne Plaza Knoxville, 401 West Summit Hill Drive, Knoxville. 3. Four Points by Sheraton Knoxville Cumberland House Hotel, 1109 White Avenue, Knoxville. 4. The Oliver Hotel, 407 Union Avenue, Knoxville. 5. Crowne Plaza Knoxville, 401 West Summit Hill Drive, Knoxville. 6. Holiday Inn, 525 Henley St, Knoxville. 7. Four Points by Sheraton Knoxville Cumberland House Hotel, 1109 White Avenue, Knoxville. 8. The Oliver Hotel, 407 Union Avenue, Knoxville. 9. Crowne Plaza Knoxville, 401 West Summit Hill Drive, Knoxville. 10. Four Points by Sheraton Knoxville Cumberland House Hotel, 1109 White Avenue, Knoxville.